The Australian Open means two weeks in January when tennis and tourists take over Melbourne. For us locals, this can be a somewhat daunting experience, with many of us giving up the opportunity to win Roger Federer's heart at the first sign of crowds. As a Melburnian, one thing I have learnt is that it is better to embrace tennis fever than to fight it. Luckily, for those inclined to avoid the grand slam cram, there is a better way. 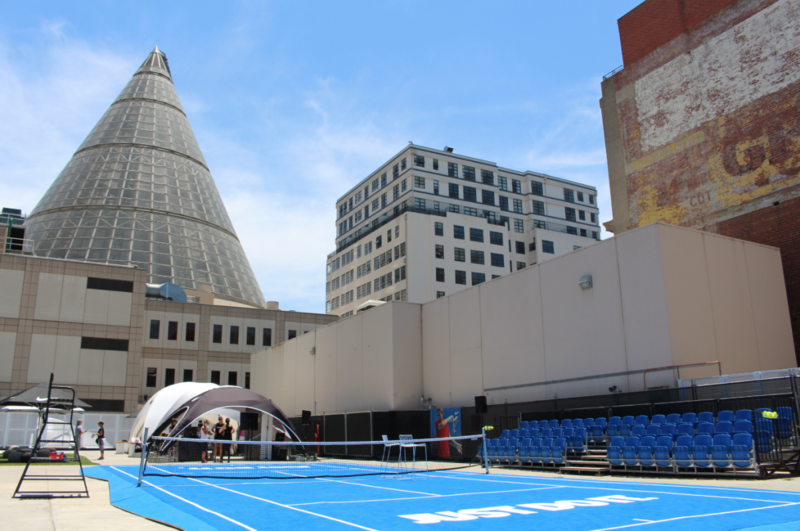 This year, the wonderful people at Melbourne Central are providing us with a little escape from the chaos of the tennis centre, via their Rooftop Tennis Club. Here, you can embrace tennis fever from a safe distance and even squeeze in a bit of shopping between matches. Sounds like the perfect day out! Spanning the duration of the Australian Open, the Rooftop Tennis Club, located on level 3 of the iconic Melbourne Central, is serving up a great spot for visitors to sit back, grab a bite to eat and watch live broadcasts of the matches taking place only 15 minutes away – you can almost hear the roar of the crowds from up there! Open daily from 11am – 7pm, with free entry, you can come and go as you please or hang around for a full day of tennis action. With Melbourne Central's location in the heart of the city, the Rooftop Tennis Club is the perfect meeting point for a day in the CBD, or the beginning of a great night out. For those not patient enough to sit through a grueling five-set match, Nike has provided a ¾ size tennis court so you can show off your skills, as well as the opportunity to familiarise yourself with all their latest tennis products and gear – you'll be a pro by the time you walk out! After watching a few games and soaking up the sun, your tummy is sure to be ready to taste some of the gourmet street food that's up for offer. From Handmade Ice Pops all natural strawberry and cream frozen treats, to Corn Boss Corn on the Cob, or maybe even a Little Champ brioche roll – there is sure to be something to get your taste buds excited. Surrounded by some stellar views of Melbourne, I can't think of a better way to experience the 2014 Australian Open. So gather your friends, your sweatbands and your game faces, the Rooftop Tennis Club at Melbourne Central has aced tennis entertainment this summer.